Christmas baking is a tradition in our home. It isn’t so much the sweets that we enjoy although let me tell you, there are some goodies made! It’s the time that we all get to spend together as a family while the baking is happening and our Christmas tree is being decorated that we all enjoy so much. There is just something about that time spent making delicious goodies together that we have all come to treasure. 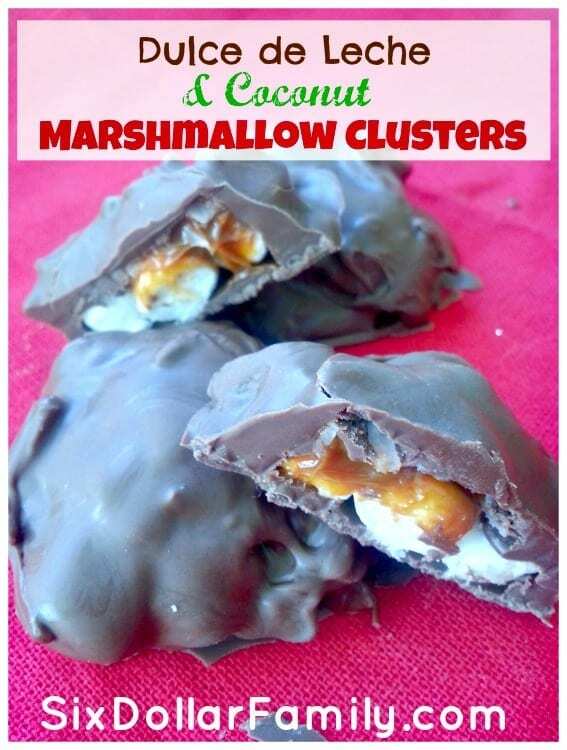 These Dulce de Leche and Coconut and Marshmallow Clusters have been one of our favorite Christmas candy recipes for a few years now. They’re not what you would think of when you think holiday cookies and candy, but our family loves the addition! 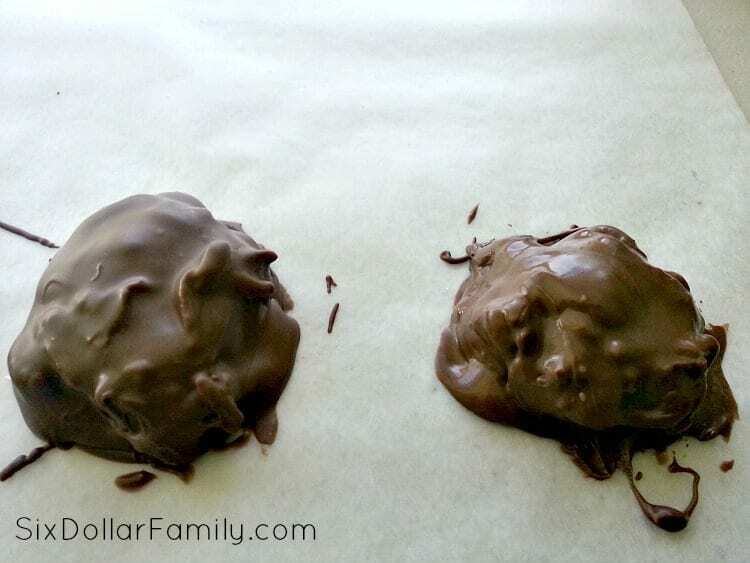 We usually make them right along side of my Copycat Girl Scout Thin Mint Truffles. They’re perfect together! If you love the flavor of Dulce de Leche, you’re going to absolutely flip at these! They’re sweet and chocolatey and when they Dulce de Leche mixes with the coconut, it is pure perfection! The best part though is that they don’t take long to make at all! There’s no real cooking involved and they’re ready to eat in about a half an hour! They’re also a great kid friendly recipe too since there isn’t much involved that the kids can’t help with. One quick note about the chocolate that you will use for your Dulce de Leche Coconut and Marshmallow Clusters; if you want to help your chocolate harden a bit more than it will on its own, you can add a tablespoon of shortening (not lard) or a small chunk of paraffin wax to it once it has melted. It might seem strange to use wax, but if you use Gulf Wax, it will allow the chocolate to harden a bit more than it will without the addition without affecting the taste of the candy. Gulf Wax is 100% safe and won’t harm the recipe or your family. Melty chocolate on your fingers is sometimes a good thing, but other times you want to keep it from happening. It’s totally up to you if you add them. Sometimes I do and other times I don’t. This recipe will yield about 12 candies. To start, melt the chocolate over a double boiler making sure that you stir it often to keep it from burning. I use this double boiler and wouldn’t use another. My candy recipes have turned out so much better since I started using it. If you don’t have a double boiler, you can make a homemade one by filling a medium saucepan half-full of water then sitting a medium metal mixing bowl on top of it. Heat the water on low and your chocolate will melt as it would with a double boiler. Just be sure to stir it often. If you’re using paraffin wax or shortening, add it with the chocolate so that it melts with it and gets mixed in well. Be sure to stir the chocolate/wax mixture well with a rubber spatula. It will seem as if your chocolate is a bit thinner than it should be, but don’t worry too much. It will harden just fine with no changes in the taste at all. To help you measure how much chocolate you will need; you can cover 3 candy clusters with 1 square of chocolate bark or 1 oz of chocolate chips. Once the chocolate and wax are fully melted, stir them together with a rubber spatula. 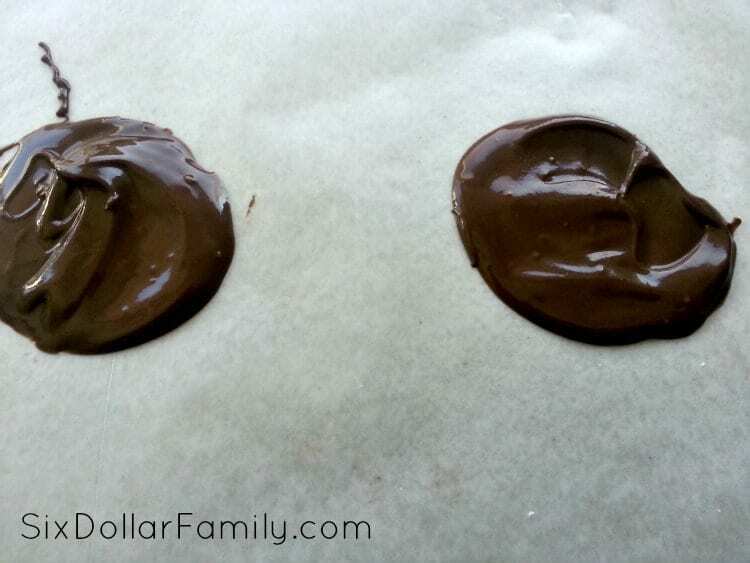 Then, drop 1 teaspoon of chocolate onto wax paper. 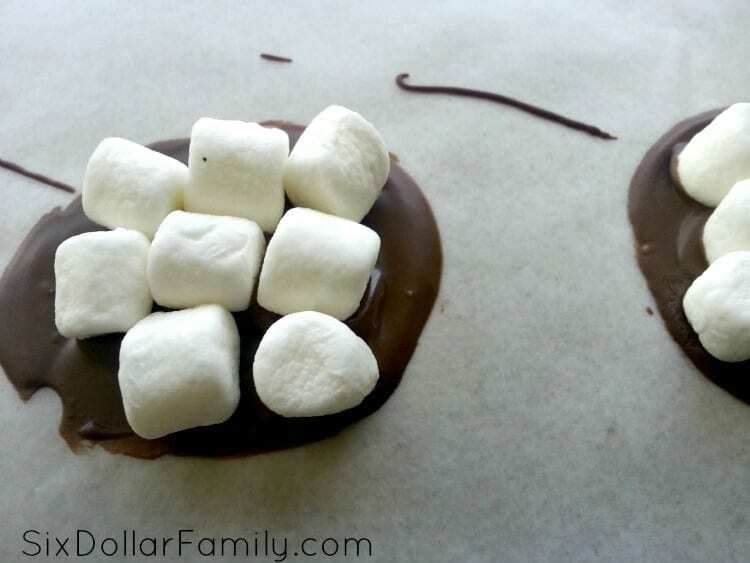 Use the back of a spoon to spread the chocolate out to a circle. 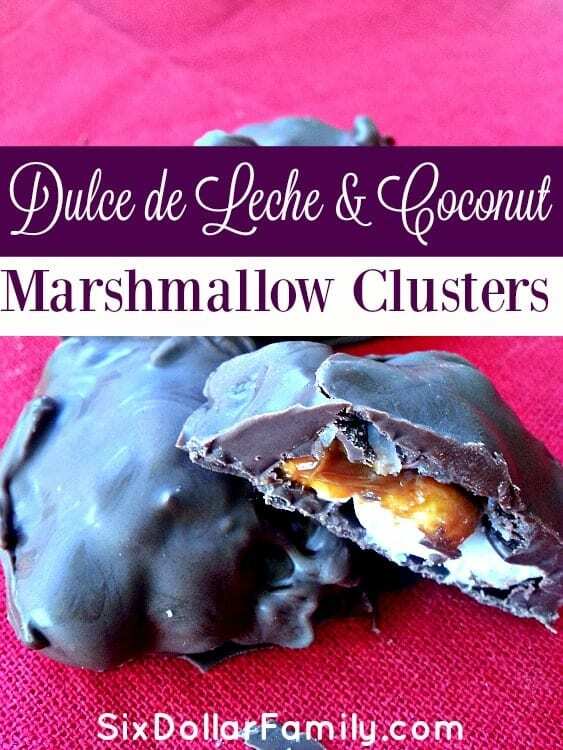 This creates the bottom of your dulce de leche and coconut marshmallow clusters. You can use parchment paper for these, but I recommend that you use actual wax paper. It will make it much easier to remove the candies once they are hardened and done. Next, add 5-6 mini marshmallows to the chocolate base while it is still warm. Be sure to press each one down into the chocolate a tiny bit so that they stay in place once the chocolate hardens. You’ll want to work quickly with this step since your chocolate will start to harden almost immediately. I tend to do one at a time since chocolate that is kept in the bowl will harden a lot slower than it does once it is on the wax paper. 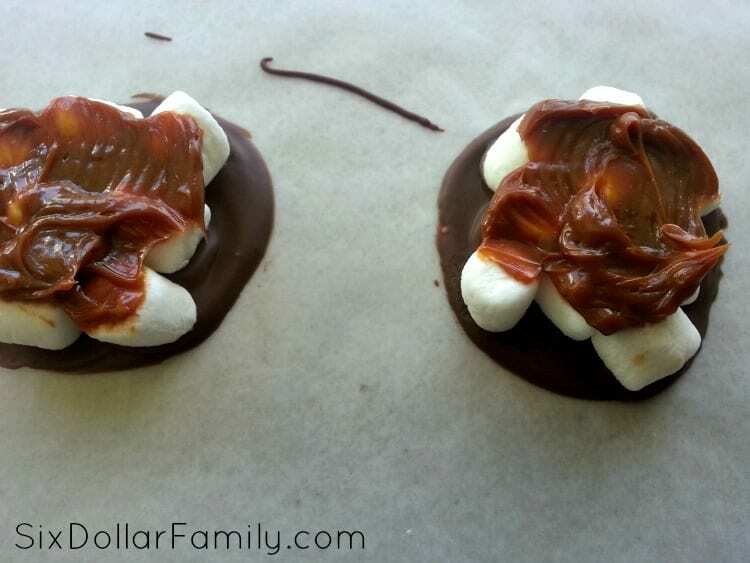 Next, use a butter knife to spread some Dulce de Leche onto the top of the marshmallows making sure that you don’t knock any marshmallows off of each base. You don’t want to add a ton but make sure that you try to get a little of the Dulce de Leche onto each mini marshmallow. Now add a pinch of coconut onto the top. Again, don’t go overboard with how much you use. Use the back of a teaspoon to lightly press the coconut into the Dulce de Leche sauce so it doesn’t fall off as easily. To finish, use a spoon to pour chocolate over the entire candy. Make sure you put enough on it so that it covers not only the top, but the sides as well. Let the chocolate harden and peel away from the wax paper! Once they’re fully hardened, they’re ready to enjoy! 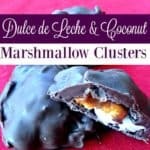 Rich and popping with awesome flavor, these Dulce de Leche & Coconut Marshmallow Clusters are just what you've been looking for in a candy recipe! Melt your almond bark squares or chocolate baking chips. You can cover three clusters with one almond bark square, or one ounce of melting chocolate per square. Lay out a large sheet of parchment paper. Drop a half tablespoon of chocolate out onto the parchment paper, using the back of the spoon to swirl chocolate out flat into a circle that is one to two inches in diameter. Before the chocolate circle goes cold and begins to set, drop 4-6 mini marshmallows onto the chocolate and lightly press down so that the bottoms of the mallows are set in the chocolate. 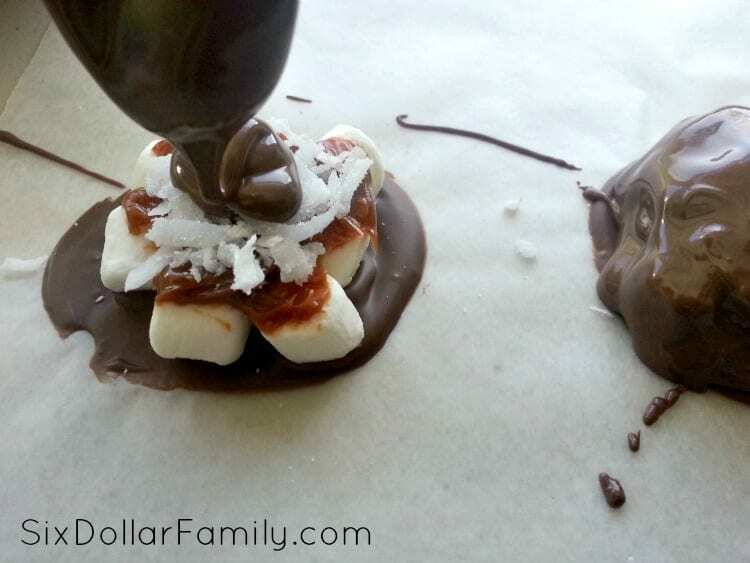 Spoon dulce de leche over the marshmallows and add a pinch of coconut onto the top of the dulce de leche. Press coconut into the dulce. 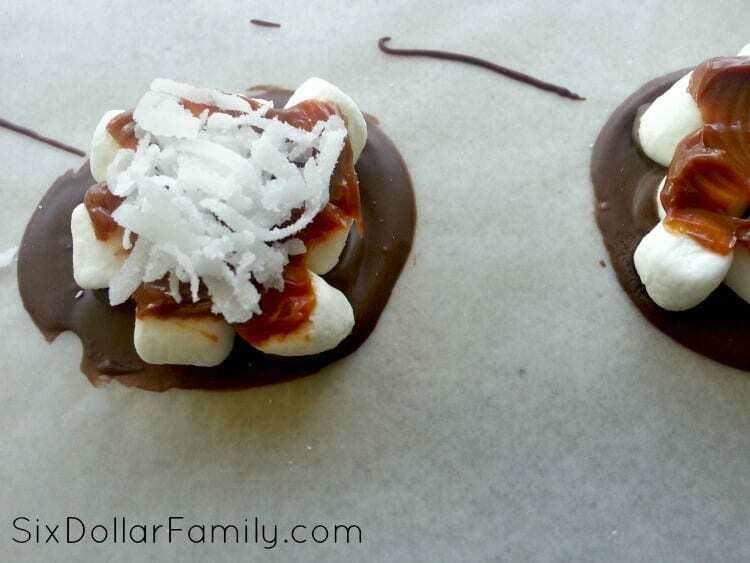 Spoon melted chocolate over the top of the entire marshmallow, dulce de leche and coconut cluster, covering completely. Allow chocolate or almond bark to harden-- takes about 5 minutes. Peel clusters away from wax paper and enjoy!